Platinum Card Members can enjoy free parking between 8:30 AM to 2 hours after park closes for one private car or motorcycle per day at the Auto Plaza. This offer does not extend to hotel parking. Subject to availability and Benefit Limits. Hong Kong Disneyland may from time to time restrict use of the car park or any part of it without prior notice, refund or compensation due to capacity, inclement weather or special events, to ensure safety, security or order, or if Hong Kong Disneyland considers that the circumstances so require. This benefit is applicable to membership cards purchased or renewed on or before July 31, 2019. For Magic Access membership cards purchased or renewed from August 1, 2019, parking benefit is available to Adult, Student and Senior Members only, and is applicable at the Auto Plaza for one private car or one motorcycle between 8:30 AM to 2 hours after the Park's scheduled closing time, subject to the following limits: Platinum Card Members may enjoy free parking. Parking benefit is not available for Child Members of any tier. Members are required to present their valid Membership card while aboard and upon entry to the Auto Plaza. Subject to availability and Benefit Limits. Hong Kong Disneyland may from time to time restrict use of the car park or any part of it without prior notice, refund or compensation due to capacity, inclement weather or special events, to ensure safety, security or order, or if Hong Kong Disneyland considers that the circumstances so require. Platinum Card Members are entitled to obtain additional FASTPASS at FASTPASS attractions listed on the Park guidemap. Subject to availability and Benefit Limits. Platinum Card Members may enjoy 50% discount for each stroller rental, this discount does not extend to block-out dates between February 5 and 11, 2019. Platinum Card Members may enjoy preferred entrance for security check and Park entry. Members are required to have security inspection at Bag Check Table as usual. Platinum Card Members may enjoy one complimentary luggage storage at the luggage valet on Park Promenade (near MTR Disneyland Resort Station). Maximum one piece of luggage per visit day. Platinum Card Members aged between 4 and 12 may reserve a space for "Jedi Training: Trials of the Temple" for the Member per show (subject to availability and Benefit Limits). Members are required to make reservation at Member Site from 2 to 4 days prior to the planned visit. Members may only reserve for one activity session per day. Members should arrive 20 minutes prior to the scheduled show time, and shall bring along the reservation confirmation and membership card. Platinum Card Members may reserve seats for "Mickey and the Wondrous Book" for the Member and up to 3 Guests per show (subject to availability and Benefit Limits). Members are required to make reservation from 2 days until 1 hour before show starts at Member Site. Within the same visit day and before the reserved show starts, Member can only reserve one show. Members and his/her Guests should arrive 25 minutes prior to show time. Platinum Card Members may enjoy priority seating at "Festival of the Lion King" with up to 3 Guests per show. Members and his/her Guests should arrive 20 minutes prior to show time (subject to availability and Benefit Limits). Up to six 1-Day Park Tickets per year; available for purchase at Ticket Booths at the Main Entrance (only valid on date of purchase) (applicable to General Admission and Child Tickets only). For Platinum Card Members, please call +852 1-830-888 for room and dining reservation concierge service; open daily from 9:00 AM - 8:00 PM. Platinum Card Members may enjoy 25% discount for dining in the Park and Hotels, for Member and up to 7 Guests, except Main Street Corner Cafe hosted by Coca-Cola®, Plaza Inn, Main Street Bakery, Market House, Outdoor Vending Carts in the Park, souvenir items, bottled drinks, Sea Breeze Bar at Hong Kong Disneyland Hotel, Chart Room Cafe at Disney Explorers Lodge, Hollywood and Dine at Disney's Hollywood Hotel, off the menu items and room service. Block out dates for Hotel Dining are: January 1, February 14, May 12 and December 21 to 31, 2019. Members in all tiers may enjoy 15% discount at Plaza Inn (tea charge, pre-meal snack charge and 10% service charge based on original price apply) for Member and up to 7 Guests. This benefit is valid from December 17, 2018. Platinum Card Members may enjoy 20% discount off for designated combo at Main Street Bakery, for Member and up to 7 Guests. Disney Private Celebration Minimum charge for Set Menu is HK$4,560; or minimum charge for Buffet Meals on weekdays is HK$7,740, and HK$8,940 for weekends, public holidays and public holiday eves. Party includes 3-hour use of designated area at Hollywood & Dine in Disney's Hollywood Hotel, reception, signage kit, party favor and designated kid's activity. Members reserving the celebration may enjoy 25% off on designated merchandise items with minimum spending of HK$1,800. Please refer to Member Site for more details. Platinum Card Members may enjoy 20% discount at all merchandise stores in the Park, Hotels and The Magic of Hong Kong Disneyland (at Terminal 1 and Terminal 2 of the Hong Kong International Airport). Discounts exclude PANDORA jewelry, CHOW TAI FOOK jewelry, purchase of photos, electronic products (e.g. digital cameras, CD players, radio), non-Disney items (e.g. drugs, films, batteries, H2O+ series), SD cards, media products (Video CDs, DVDs), LEGO items and other items as HKITP may specify from time to time. Members of all tiers may enjoy 10% discount on PANDORA Jewelry. Members of all tiers may enjoy HK$100 discount upon HK$2,000 purchase on CHOW TAI FOOK Jewelry. 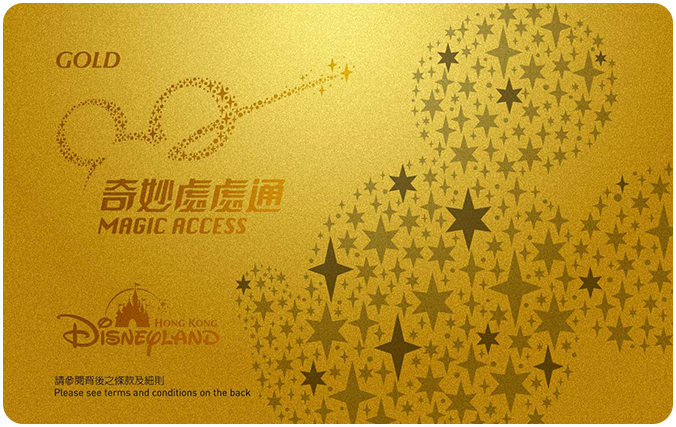 Member of all tiers may purchase "Disney PhotoPass+" at HK$199. Member of all tiers may purchase bundle of "Disney PhotoPass+" and "one 8R photo print" at HK$298. These offers are not applicable for photo service in Bibbidi Bobbidi Boutique, character dining and special events that require separate charge. Members of all tiers may receive total of HK$600 Merchandise vouchers upon purchase of Castle Package (HK$1,980) at Bibbidi Bobbidi Boutique. This benefit is valid from February 1, 2019. Members may enjoy discount on the prevailing rate of the Hotels. Actual price depends on the check-in date and the room category selected. This benefit may not be used on block out dates including February 6 to 9, December 24 to 26 and December 28 to 31, 2019. During the birthday month of a Platinum Card Member, the Member may enjoy 25% off, for any purchases of three (3) one-day admission tickets within one single transaction once (General Admission and Child tickets only, available at Ticket Booths of the Park). Four (4) Priority Admission Pass tickets will be issued along with this offer. Tickets purchased under this offer are valid on the date of purchase only and the Member shall accompany their Guests in entering the Park. Tickets purchased under this offer are upgradable to Magic Access on the day of purchase with 15% discount on the published rate. The offer can only be used by Platinum Card Member together with at least one additional Guest, purchasing the same buffet in the same restaurant. This is not available for full round seating dinner buffet. 10% service charge will apply based on original price. This offer may not be used in conjunction with any other discount or promotion (including any Member dining offer). Coupon has to be presented to enjoy the offer. Block out dates include January 1, February 14, May 12 and December 21 to 31, 2019. 1 free birthday cake for Platinum Card Member when enjoying dinner at Enchanted Garden Restaurant, Chef Mickey or Walt's Cafe with at least one paying Guests. Reservation is required 48 hours in advance and is subject to availibility. Birthday cake is available in round shape only; party favors are not included. Coupon has to be presented to enjoy the offer. January 1, February 14, May 12 and December 21 to 31, 2019 are block out dates. Members may enjoy 50% off discount for afternoon tea set for two at Walt's Cafe. This offer may not be used in conjunction with any other discount or promotion (including any Member dining offer). Members may enjoy this benefit with up to two afternoon tea set for two with this benefit. Coupon has to be presented to enjoy the offer. 10% service charge will apply based on original price. Block out dates include January 1, February 14, May 12 and December 21 to 31, 2019. Platinum Card Members can enjoy HK$100 discount per purchase of HK$300 during dinner period in a single transaction (except off the menu items). This offer may not be used in conjunction with any other discount or promotion (including any Member dining offer). This discount may only be used for up to 8 Guests and the Member must be one of the dining Guests. Coupon has to be presented to enjoy the offer. 10% service charge will apply based on original price. January 1, February 14, May 12 and December 21 to 31, 2019 are block out dates. 1 free drink of any beverage at Plaza Inn or Main Street Corner Cafe hosted by Coca-Cola®. This offer may be used by the Platinum Card Member together with at least one additional Guest purchasing a beverage of equal or higher value. Coupon has to be presented to enjoy the offer. * Benefits may be subject to controls which may limit the number, type and other features of the benefits allocated for Magic Access Membership Program, or which may restrict the number or eligibility of Members to whom the benefit is offered (collectively, "benefit limits"). 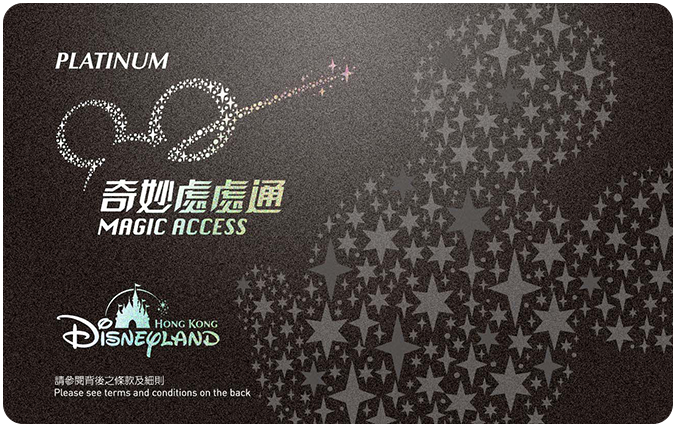 # Platinum Card Members are entitled to redeem 1 set of complimentary birthday benefit coupons during their Birthday month at Magic Access Member Service Center, Main Street, U.S.A. inside the Park, Hong Kong Disneyland Hotel, Disney's Hollywood Hotel or Disney Explorers Lodge. For example, a Platinum Card Member whose birthday falls in September can enjoy this benefit once on any day in September. The benefits listed above are subject to change and is valid between January 1, 2019 and December 31, 2019 unless otherwise specified. Please visit our website any time to check out the latest benefits for Magic Access. Gold Card Members can enjoy free parking between 8:30 AM to 2 hours after park closes for one private car or motorcycle per day at the Auto Plaza. This offer does not extend to hotel parking. Subject to availability and Benefit Limits. Hong Kong Disneyland may from time to time restrict use of the car park or any part of it without prior notice, refund or compensation due to capacity, inclement weather or special events, to ensure safety, security or order, or if Hong Kong Disneyland considers that the circumstances so require. This benefit is applicable to membership cards purchased or renewed on or before July 31, 2019. For Magic Access membership cards purchased or renewed from August 1, 2019, parking benefit is available to Adult, Student and Senior Members only, and is applicable at the Auto Plaza for one private car or one motorcycle between 8:30 AM to 2 hours after the Park's scheduled closing time, subject to the following limits: Gold Card Members may enjoy this parking benefit for free on up to 24 days per calendar year, and for each subsequent use of the Auto Plaza, at HK$40 off the prevailing parking charge for private cars or HK$15 off for motorcycles. Parking benefit is not available for Child Members of any tier. Members are required to present their valid Membership card while aboard and upon entry to the Auto Plaza. Subject to availability and Benefit Limits. Hong Kong Disneyland may from time to time restrict use of the car park or any part of it without prior notice, refund or compensation due to capacity, inclement weather or special events, to ensure safety, security or order, or if Hong Kong Disneyland considers that the circumstances so require. Gold Card Members are entitled to obtain additional FASTPASS at FASTPASS attractions listed on the Park guidemap. Subject to availability and Benefit Limits. Gold Card Members may enjoy 50% discount for each stroller rental, this discount does not extend to block-out dates between February 5 and 11, 2019. Gold Card Members may enjoy 10% discount for dining in the Park and Hotels, for Member and up to 7 Guests, except Main Street Corner Cafe hosted by Coca-Cola®, Plaza Inn, Main Street Bakery, Market House, Outdoor Vending Carts in the Park, souvenir items, bottled drinks, Sea Breeze Bar at Hong Kong Disneyland Hotel, Chart Room Cafe at Disney Explorers Lodge, Hollywood and Dine at Disney's Hollywood Hotel, off the menu items and room service. Block out dates for Hotel Dining are: January 1, February 14, May 12 and December 21 to 31, 2019. Gold Card Members may enjoy discount at 25% for the months of January, March, May, July, September and November 2019. All the terms and conditions attached to the "Regular Dining Offer" apply equally to the "Seasonal Dining Offer". Gold Card Members may enjoy 15% discount off for designated combo at Main Street Bakery, for Member and up to 7 Guests. Gold Card Members may enjoy 10% discount at all merchandise stores in the Park, Hotels and The Magic of Hong Kong Disneyland (at Terminal 1 and Terminal 2 of the Hong Kong International Airport). Discounts exclude PANDORA jewelry, Chow Tai Fook jewelry, purchase of photos, electronic products (e.g. digital cameras, CD players, radio), non-Disney items (e.g. drugs, films, batteries, H2O+ series), SD cards, media products (Video CDs, DVDs), LEGO items and other items as HKITP may specify from time to time. During the birthday month of a Gold Card Member, the Member may enjoy 20% off, for any purchases of three (3) one-day admission tickets within one single transaction once (General Admission and Child tickets only, available at Ticket Booths of the Park). Four (4) Priority Admission Pass tickets will be issued along with this offer. Tickets purchased under this offer are valid on the date of purchase only and the Member shall accompany their Guests in entering the Park. Tickets purchased under this offer are upgradable to Magic Access on the day of purchase with 15% discount on the published rate. The offer can only be used by Gold Card Member together with at least two additional Guests, purchasing the same buffet in the same restaurant. This is not available for full round seating dinner buffet. 10% service charge will apply based on original price. This offer may not be used in conjunction with any other discount or promotion (including any Member dining offer). Coupon has to be presented to enjoy the offer. Block out dates include January 1, February 14, May 12 and December 21 to 31, 2019. Gold Card Members can enjoy HK$100 discount per purchase of HK$300 during dinner period in a single transaction (except off the menu items). This offer may not be used in conjunction with any other discount or promotion (including any Member dining offer). This discount may only be used for up to 8 Guests and the Member must be one of the dining Guests. Coupon has to be presented to enjoy the offer. 10% service charge will apply based on original price. January 1, February 14, May 12 and December 21 to 31, 2019 are block out dates. Gold Card Members may enjoy buy 2 get 1 free Colorful Brunch or Dessert Moment upon two additional Guests at World of Color Restaurant at Disney Explorers Lodge at original price during birthday month. Free Colorful Brunch or Dessert Moment is benefited to the birthday Member only. This offer may not be used in conjunction with any other discount or promotion (including any Member dining offer). Coupon has to be presented to enjoy the offer. 10% service charge will apply based on original price. Block out dates include January 1, February 14, May 12 and December 21 to 31, 2019. 1 free combo meal at Explorer's Club Restaurant, Royal Banquet Hall or Starliner Diner in Hong Kong Disneyland for Gold Card Member. This offer may only be used by the Member together with at least one additional Guest purchasing a combo meal of equal or higher value. Coupon has to be presented to enjoy the offer. This offer may not be used in conjunction with any other discount or promotion (including any Member dining offer). Members are entitled to enjoy a complimentary admission to the Park on the exact date of Member's birthday, even if it falls on one of the block-out dates of their Magic Access Membership Card. Complimentary ticket is available for redemption at the Guest Relations window in the Park (only valid on date of redemption). # Gold Card Members are entitled to redeem 1 set of complimentary birthday benefit coupons during their Birthday month at Magic Access Member Service Center, Main Street, U.S.A. inside the Park, Hong Kong Disneyland Hotel, Disney's Hollywood Hotel or Disney Explorers Lodge. For example, a Gold Card Member whose birthday falls in September can enjoy this benefit once on any day in September. Silver Card Member can enjoy HK$40 off for private car, HK$15 off for motorcycle between 8:30 AM to 2 hours after park closes for one private car or motorcycle per day at the Auto Plaza. This offer does not extend to hotel parking. Each Member may only benefit from discounted parking for one vehicle per day. Subject to availability and Benefit Limits. Hong Kong Disneyland may from time to time restrict use of the car park or any part of it without prior notice, refund or compensation due to capacity, inclement weather or special events, to ensure safety, security or order, or if Hong Kong Disneyland considers that the circumstances so require. This benefit is applicable to membership cards purchased or renewed on or before July 31, 2019. 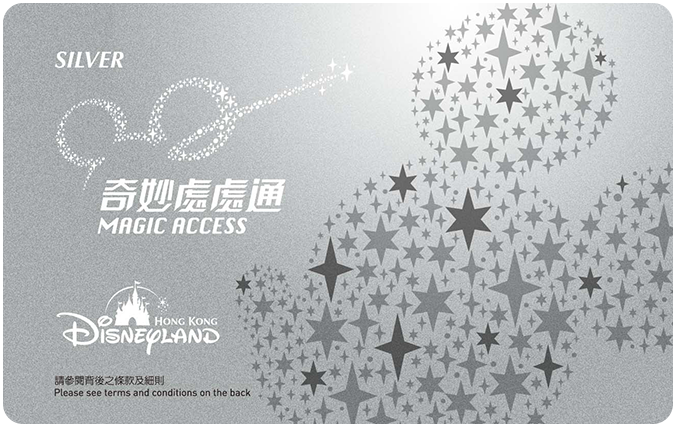 For Magic Access membership cards purchased or renewed from August 1, 2019, parking benefit is available to Adult, Student and Senior Members only, and is applicable at the Auto Plaza for one private car or one motorcycle between 8:30 AM to 2 hours after the Park's scheduled closing time, subject to the following limits: Silver Card Members may enjoy HK$40 off the prevailing parking charge for private cars or HK$15 off for motorcycles. Parking benefit is not available for Child Members of any tier. Members are required to present their valid Membership card while aboard and upon entry to the Auto Plaza. Subject to availability and Benefit Limits. Hong Kong Disneyland may from time to time restrict use of the car park or any part of it without prior notice, refund or compensation due to capacity, inclement weather or special events, to ensure safety, security or order, or if Hong Kong Disneyland considers that the circumstances so require. Effective from January 1, 2019, Silver Card Members with five or more visits to the Park during each membership year may redeem one complimentary admission ticket to the Park within 30 calendar days from the 5th visit to the Park. Complimentary admission ticket may be redeemed at Ticket Booths at the Main Entrance by the Member. The complimentary admission ticket admits the Member only and is valid on the day of redemption (whether or not such date is a block-out date of Silver Magic Access) but not on other dates. Admission to the Park using the complimentary admission tickets will not be counted as an eligible admission in the "Magic Milestone" Reward Program. Each eligible Silver Card Member may redeem maximum one complimentary admission ticket in each membership year. Silver Card Members may enjoy 10% discount for dining in the Park and Hotels, for Member and up to 7 Guests, except Main Street Corner Cafe hosted by Coca-Cola®, Plaza Inn, Main Street Bakery, Market House, Outdoor Vending Carts in the Park, souvenir items, bottled drinks, Sea Breeze Bar at Hong Kong Disneyland Hotel, Chart Room Cafe at Disney Explorers Lodge, Hollywood and Dine at Disney's Hollywood Hotel, off the menu items and room service. Block out dates for Hotel Dining are: January 1, February 14, May 12 and December 21 to 31, 2019. Silver Card Members may enjoy discount at 25% for the months of March, July and November 2019. All the terms and conditions attached to the "Regular Dining Offer" apply equally to the "Seasonal Dining Offer". Silver Card Members may enjoy 10% discount off for designated combo at Main Street Bakery, for Member and up to 7 Guests. Silver Card Members may enjoy 10% discount at all merchandise stores in the Park, Hotels and The Magic of Hong Kong Disneyland (at Terminal 1 and Terminal 2 of the Hong Kong International Airport). Discounts exclude PANDORA jewelry, Chow Tai Fook jewelry, purchase of photos, electronic products (e.g. digital cameras, CD players, radio), non-Disney items (e.g. drugs, films, batteries, H2O+ series), SD cards, media products (Video CDs, DVDs), LEGO items and other items as HKITP may specify from time to time. This benefit may be redeemed at following location for Silver Card Members only: Chef Mickey - One dinner buffet. This offer may only be used by Silver Card Member together with at least three additional Guests, purchasing the same buffet in the same restaurant. Free dinner is benefited to the birthday Member only. An extra charge of HK$100 for the Silver birthday Member is applicable to dinner buffet consumed on weekends, Public Holidays or Public Holiday eves. Block out dates include January 1, February 14, May 12 and December 21 to 31, 2019. This is not available for full round seating dinner buffet. This offer may not be used in conjunction with any other discount or promotion (including any Member dining offer). Silver Card Members are required to present their valid Membership Card upon payment, no coupons are needed. 1 free combo meal at Explorer's Club Restaurant in Hong Kong Disneyland for Silver Card Member. This offer may only be used by the Member together with at least one additional Guest purchasing a combo meal of equal or higher value. This offer may not be used in conjunction with any other discount or promotion (including any Member dining offer). Members are required to present their valid Membership Card at cashier, no coupons are needed. Members are entitled to enjoy a complimentary admission to the Park on the exact date of Member's birthday, even if it falls on one of the block-out dates of their Magic Access Membership Card. Complimentary ticket is available for redemption at the Guest Relations window in the Park (only valid on date of redemption). For verification purposes, Members are required to present their Membership Cards and such personal identification as HKITP may require. * Benefits may be subject to controls which may limit the number, type and other features of the benefits allocated for Magic Access Membership Program, or which may restrict the number or eligibility of Members to whom the benefit is offered (collectively, “benefit limits”). For more detailed information about Magic Access, please see Magic Access Terms and Conditions.